In a move that might at least cheer up cheer up refugees a bit, Tony has decided to turn his attention to beating up on welfare recipients for a bit of variety. This pretty much involves getting unemployed people into the fruit-picking game, which can indeed be lucrative and fun. Hey, I’m Tasmanian and picked my share of apples in the days before I became a cartooning millionaire. Lots of fresh air and all the fruit you can eat. 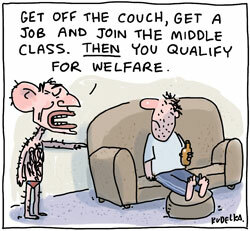 It’s not like Tony doesn’t have a point either, welfare should be for people who really need it, but to stretch the fruit analogy possibly a bit too far, while the low hanging fruit is easier to get at, there’s some juicier stuff higher up the income tree that could use a bit of tough love as well if he was inclined to get off his arse and find a ladder. Best not to mention the proposition that enforced menial labour may be worse for long term productivity than unemployment queues with non-punitive incentives and programs. If you think fruit picking is menial labour, you’ve maybe never picked fruit ;-). Moreover if you think working for your income is “enforced” then only the unemployed are presently lucky enough to be freed of enforced labour (menial or otherwise). As an aside, I don’t know whether I support the idea of work for the dole or not, and agree there may be much higher fruit worth aiming at (unfortunately it’s the same high fruit that donates gratuitously to the election slush fund). But niggles over enforced and menial also hold little merit for me. Work is work, and the “right” to an income of any kind is a nebulous thing at best, rather ill defined and to mind something we as a society grant to one another with or without prerequisites and constraints. Discussion around that is perfectly fine. Hey, I quite enjoyed picking apples. Paid better than the cartoons at the time, though the hours were a bit tougher. Was probably in the ballpark of “menial” though. Usual predictably genuis cartoon. A nice lady on the ABC explained that everything he is suggesting already happens and implied he did not know the system He is just playing to the gallery as usual. Karin just cleaned up the bookshelf, and we’ve rediscovered the little black tome (‘HaiKudelka’). I like the penguins on the ice floe, and the clever little lemming. And the comfy chair which doubts its existence until the lounging of a good book! See you, Michael.